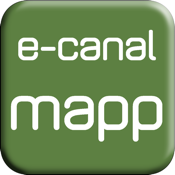 e-canalmapp North West (one of a set of 10 regional apps covering Great Britain) is the definitive waterway guide and map for the North West of England for boaters, ramblers, cyclists, etc. - but don't worry, it does NOT tell you to "Turn around where possible"! * Dedicated iPad version available BUT wifi only iPads will NOT display your location if no wifi connected.